No one likes dirty laundry – especially if it’s piling up because your washing machine is broken. Whenever you have problems with this appliance, it’s usually best to call a plumber for washing machine repair. 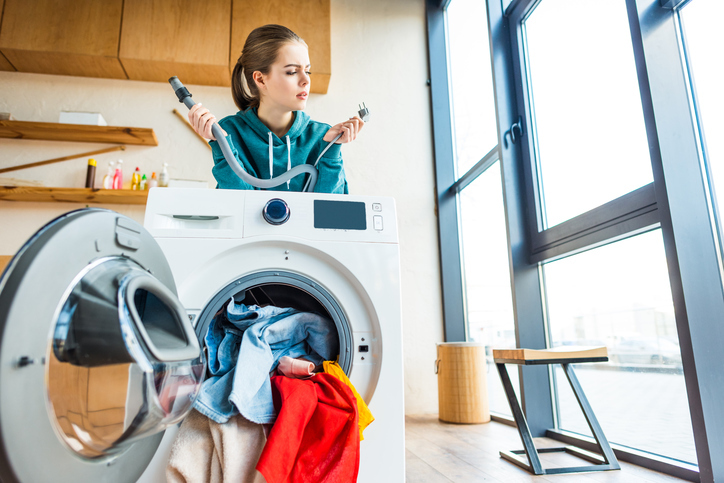 Plumbing professionals like the ones at Delk Plumbing are able to find the cause of your washer’s malfunctions, which can be complicated. But some problems are more simple, such as problems with your drain hose. What does a washer’s drain hose do? Ever wonder what happens to all that soapy water after you wash a load of laundry? Well, you can thank your washer’s drain hose for getting rid of it. The drain pump removes all the water from the tub of your washer and sends it down the drain hose to your home’s sewer system. While this process is efficient, a problem with your hose can create major problems for your home. If the drain hose gets clogged, it could cause the waste water from your washing machine to back up into your home. But a more common problem is when the hose cracks or gets a leak. If you’re not at home when this happens, you could find yourself facing a flood. How can you tell if there’s a problem with your drain hose? First of all, it’s important to inspect your drain hose to see it has any signs of damage. Next, make sure it’s connected securely to your washer. For more complicated situations, we recommend that you contact a professional plumber for washing machine repair. We know the ins and outs of these problems and can fix it without causing any additional headaches. If you need to get your washer fixed in the Summerville, SC area, contact Delk Plumbing. We’ll help get your washing machine back up and running at full speed as quickly as possible!